During this graduation season, you might need some guidance in selecting suitable gifts. In the past, I’ve bestowed books of graduation speeches, which fascinate me, and I’ve given Harlan Cohen’s The Naked Roommate: And 107 Other Issues You Might Run Into in College (which delighted the recipient because her mother did, indeed, have a naked roommate). 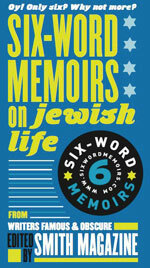 Now, I write to tout the whimsy and insight of Six-Word Memoirs on Jewish Life, edited by Smith Magazine in partnership with Reboot, a non-profit with a mission of triggering discussions about Jewish identity, community, and meaning. Now known as “flash fiction,” the six-word story derives its literary genesis from lore that Ernest Hemingway won a bet with the challenge to write a novel in just six words with the following: “For sale: baby shoes, never worn.” A reviewer from the St. Louis Post-Dispatch called this style an American haiku. Smith Magazine has trademarked its Six-Word Memoirs series; this newest addition is a much quicker read than a graduation speech! Be a mensch; pass it on. World is narrow bridge, be brave! I was in need. Heard: Hineini. Israel means “to wrestle.” Explains everything. Like Zusya, trying to be me. What is hateful to you, do not do to your fellow. What a happy coincidence. As author of What Is Shabbat: A Time Manifesto, I’m thrilled to learn that Reboot, “a New York-based nonprofit that reinvents Jewish rituals and traditions for a new generation, has developed an annual tech detox as a modern day Sabbath to encourage young, hyper-connected, and frequently frantic people to take a respite from all things digital.” Reboot is offering an Unplugging Pledge that asks people to take a tech detox for the 2012 National Day of Unplugging. Those who take the pledge on Causes.com can easily share it with friends and family through Facebook, Twitter and e-mail. 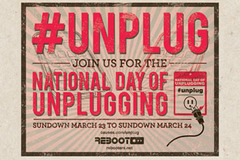 Reboot reports they root their support for the National Day of Unplugging, March 23-24, in their Sabbath Manifesto. The Time Manifesto and the 10 Principles of the Sabbath Manifesto follow the jump. by Rabbi Dr. Goldie Milgram as first published in Reclaiming Judaism as a Spiritual Practice: Holy Days and Shabbat . Has become a radical spiritual act of self care. There’s no refund at the finish line. “Take ownership of your own time? “Oh, no, I won’t give all my precious time to you. I am writing the Torah of my life with each lived day! Not race whipped to the finish line. “No reason to think, no need to reflect. You look up at the stars and express the awe you feel? You stop to question the ethics of your own actions? say a memorial prayer for your parents? The work ethic is your spiritual model! Our company is your family. Whether Reboot, or Milgram, the important source is Torah. Do we ever need Shabbat now! It is our stimulus and solace for facing the pharaohs of contemporary life – the corporations, employers, work-a-holism, e-mail addiction, lifestyles beyond one’s means, this is pure teshuvah, the Jewish mitzvah of returning to healthy and holy alignment. However this precious Torah of awareness comes to you, may you be blessed to go for it! Unplug this Shabbat and, as the Talmud teaches, experience 1/60 of paradise. I’m thrilled at Reboot’s many creative programs. Let’s take the pledge!